Will Paul Ehrlich's prediction finally come true? In the period 1975–2018, world population increased steadily at 83 million per year, and reached 7.6 billion in 2018. The increase in 2017 was the difference between approximately 145 million births and 62 million deaths. Despite population growth, the global average daily food supply per person rose from 2,440 kilocalories in 1975 to 2,940 kilocalories in 2015. However, over 800 million people are undernourished and over 600 million adults are obese. Cereals are the most important crops for food and livestock feed; globally, 45 per cent of the cereal harvest is consumed as food for humans, and 35 percent as feed for livestock; the remainder is used for industrial purposes, including ethanol, beer, whisky and vodka. The rise in world cereal production since the 1960s is mainly due to two technological advances. The first was Haber-Bosch ammonia synthesis, in which atmospheric nitrogen is fixed as ammonia which plants utilise for protein formation. Production of Haber-Bosch ammonia began in 1913, and the consumption of nitrogen fertiliser reached 103 million metric tons in 2014-2015. 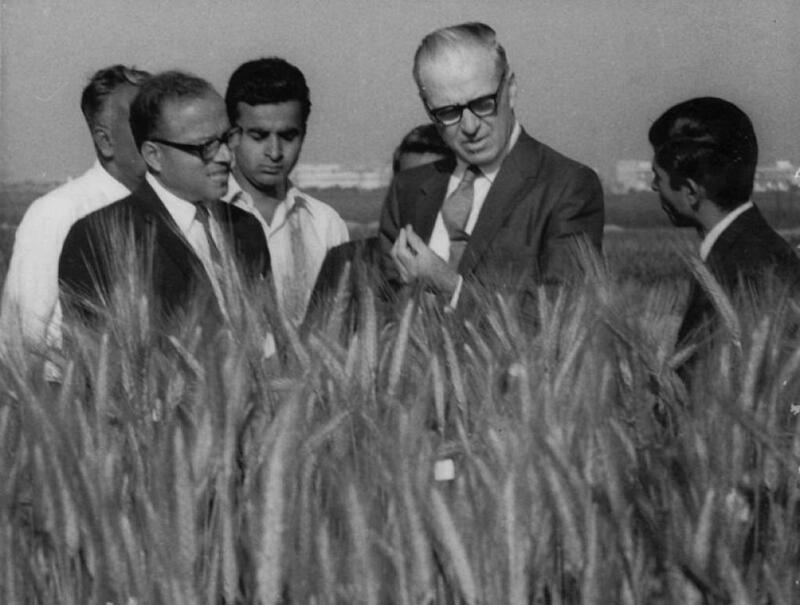 The second advance was the Green Revolution that began in the 1960s, after agronomist Norman Borlaug had bred varieties of wheat that give higher yields in response to heavier applications of nitrogen, phosphorus and potassium fertiliser. The breeding and use of high-yielding rice and maize paralleled that of wheat. The most striking achievement of chemical agriculture is the maize yield in the US, which rose from 2.5 tonnes per hectare (40 bushels per acre) in 1950 to 11.0 tonnes per hectare (175 bushels per acre) in 2016. The global cereal yield rose from 1.16 tonnes per hectare in 1950 to 3.97 tonnes in 2016. The yield in 2050 will probably reach 5.5 tonnes per hectare, thereby raising production per person from the present 380 kilograms per year to 400 kg (assuming no change in the cereal area and that the world population will be 9.8 billion). The global average nitrogen application on cereal crops, 80 kg per hectare in 2015, would be approximately 130 kg per hectare. Globally, less than half of the applied nitrogen is taken up by crop plants; the remainder volatilises in the form of ammonia and nitrous oxide or leaches to groundwater, resulting in eutrophication (the formation of algae) in rivers, lakes and coastal waters; this creates “dead zones” in which fish cannot live. Applying large amounts of fertiliser to crops changes the balance between these nutrients and those needed in small or trace amounts; the latter include calcium, sulphur, magnesium, iron, manganese, copper, zinc, cobalt, boron and selenium. Approximately 40 per cent of global irrigation water is obtained by pumping groundwater from tube wells; this has resulted in the depletion of aquifers and the lowering of groundwater levels, thereby contributing 0.4 millimeters to the global sea level rise of 3.4 millimeters per year. In 1950, France had a population of 42 million and 20 million hectares of arable land, i.e. 2 persons per arable hectare. The nitrogen fertiliser application on cereals was negligible, and cereal production per person was about 400 kilograms per year, slightly higher than the present world average. If the ratio of population to arable land were 2 persons per hectare on the world’s 1.6 billion arable hectares, the world population would be 3.2 billion. Reducing world population to this size would mean reducing the global average fertility rate (currently 2.5 children per woman) to 1.5 by 2050 and holding it at that level until 2200. The proportion of the population in the 65+ age-group would rise to 35 percent. Such a drastic change in the age distribution would mean raising the pensionable age to 70 years or more. Enforcing a population limit for each country would be an insurmountable obstacle, as Charles Galton Darwin pointed out in “The next million years”(1952). Canada, Russia, Australia and Argentina would not need to reduce their populations, while China and India would each have to reduce its population to roughly 300 million, one-fifth of the present population. The relative reduction in Japan and Egypt, which have 28 inhabitants per arable hectare, would be much greater. The population of China is projected to peak at 1.45 billion around 2030 and decline to one billion by 2100. This is partly a result of the so-called one-child policy launched in 1979 (in reality a 1.5-child policy). It was replaced by a two-child limit in 2016, but the fertility rate remains 1.6. Japan has a population of 127 million; it is projected to decline to 60 million in 2100. South Korea, Taiwan and several European countries have fertility rates even lower than Japan’s 1.4. However, the best we can hope for is a world population peak of 10 billion around 2070, which would make it necessary to increase the consumption of nitrogen fertiliser to at least 160 million tonnes per year. This is not sustainable, but there is no solution in sight.